Luis Argueta is one of the most dedicated people I know. He left his native Guatemala during the years of civil war in his country, but Guatemala never left his heart. Luis Argueta, a Guatemalan-born U.S. citizen, film director, and producer has been telling transnational immigrant stories since 1977. 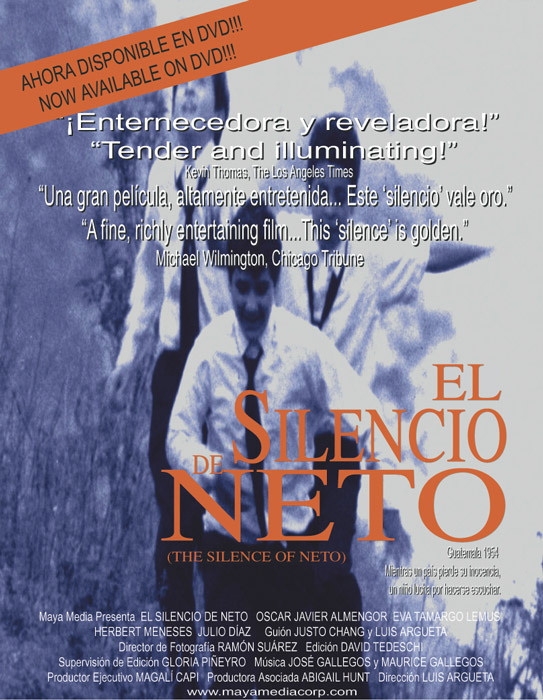 Argueta’s 1994 film, “El Silencio de Neto,” was submitted in the foreign film category in the 67th Academy Awards. It was a landmark first submission from Guatemala. He is also the first and only filmmaker to be awarded the Orden del Quetzal in the degree of Grand Officer, Guatemala’s highest honor. Argueta is considered one of Guatemala’s National Living Icons, alongside Nobel Laureate Rigoberta Menchu and singer/songwriter Ricardo Arjona. 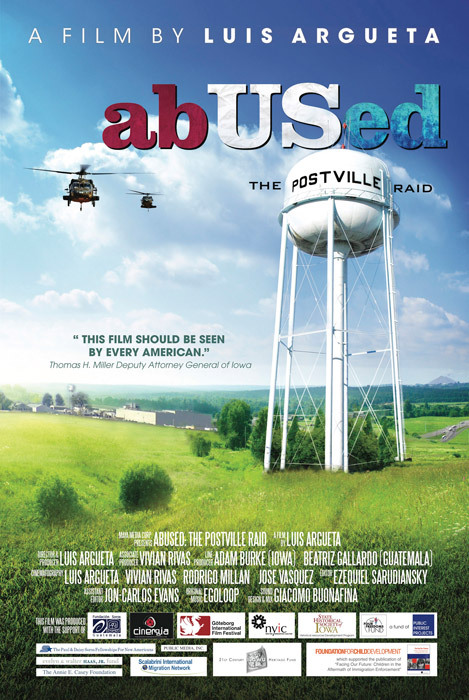 In 2010, Argueta released “abUSed: The Postville Raid” — a film about the devastating effects of U.S. immigration enforcement policies on children, families, and communities. 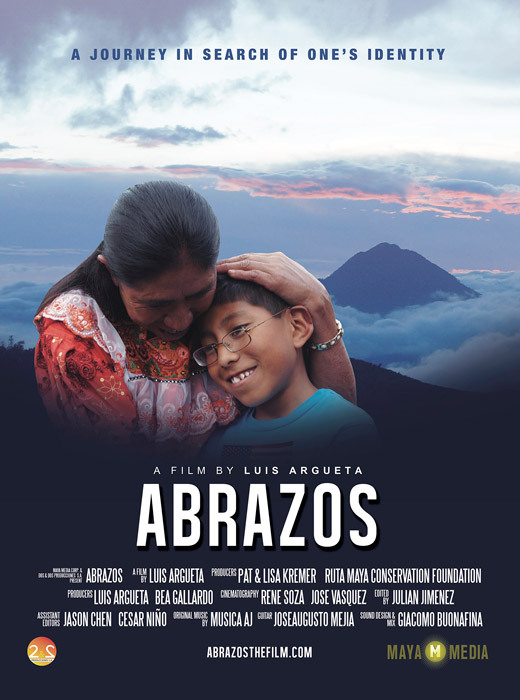 “ABRAZOS” (2014), the second film in Luis Argueta’s immigration series, follows the journey of 14 Guatemalan children (U.S. citizens) from Minnesota to Guatemala to meet their grandparents, and in some instances their siblings — for the first time. These stories are important now more than ever as the level and tenor of misinformation and “fake news” is swirling around the recent Honduran Caravan. The immigrants are often depicted as hardened criminals and, as the U.S. President put it, “thieves and rapists,” and their ranks filled with Middle Eastern terrorists. As of Nov. 20, 2018, he has sent approximately 5,900 U.S. troops to fortify the southern border between the U.S. and Mexico. 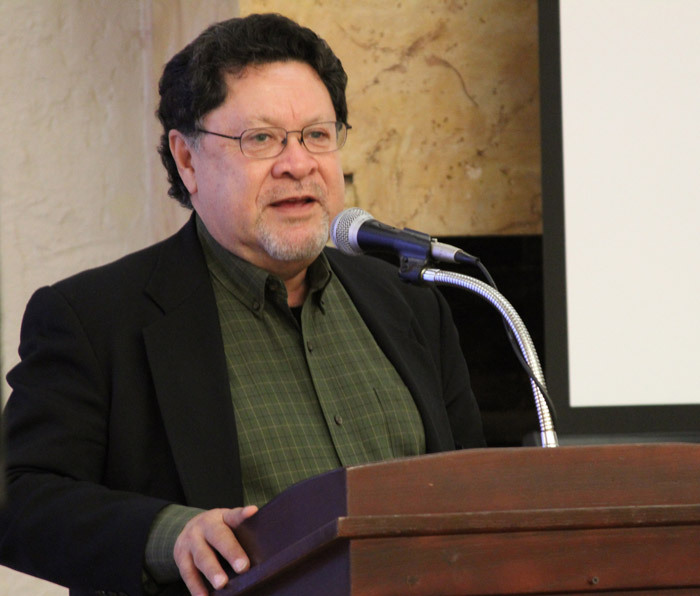 Luis Argueta grew up in Guatemala during an extremely repressive period in a very strict family where he was cautioned not to question the status quo and stay quiet, because “you never knew who was listening.” He did as he was told. As a young man, he enrolled at the Universidad Landívar in Guatemala City. He was also granted a scholarship to the University of Michigan in Ann Arbor with an eye toward industrial engineering. But before departing for the U.S., his path crossed a *Peace Corps Volunteer (PCV) who would impact him in many ways over the years. Upon his arrival in 1967 at the Universidad Landívar, PCV Ken Lehman was asked to help coach scholarship recipients, Argueta being one of them. Lehman focused on freshman English and asked his students to write a series of essays. Through this process, Argueta was introduced to “The Children of Sanchez” by Oscar Lewis. After reading the book, he understood for the first time the power of storytelling through personal narratives. Lehman, knowing Argueta was going to study for an engineering degree, thought he was far too creative and artistic for that line of work. During Lehman’s class, his students became aware of the activism around the civil rights movement in the U.S. The students asked to get involved in social issues and formed LEA (Landívarianos En Acción). The acronym LEA in English means READ. The students began teaching literacy in social centers in the barrios of Guatemala City, Argueta was a charter member before departing for to the U.S. He completed his industrial engineering degree at the University of Michigan and went on to follow his passion by obtaining a master’s degree in comparative literature. His thesis included the production of a one-hour film based on the works of Fernando Arrabal, a Spanish playwright who lived in Paris, France. When Arrabal screened Argueta’s film, he invited Argueta to work with him on a feature in Italy. Eventually, Argueta moved to New York and began a career in advertising. Initially, he produced short pieces for other companies until setting up his own business in 1989. His work included commercials for blue-chip companies, first in English and then in Spanish. But after 9/11 he realized that he wanted to find something that would “fill him” in a different way. In the 1990s, Argueta began to focus on filmmaking and “… went back to my roots and told the story of the people of Guatemala both in fiction and documentary films for a better understanding of Guatemalans on a global platform.” In 1994, Argueta produced the first feature-length film by a Guatemalan titled, “The Silence of Neto,” which was screened at the Sundance Independent Film Festival in Park City, Utah. It was also the first submission from Guatemala in the foreign film category for the 67th Academy Awards. Argueta’s career would take a turn when he heard about the most extensive and most costly migration raid carried out in the history of the U.S. *Nine hundred Federal Agents, heavily armed, supported by helicopters, State Police (State Troopers) and prison buses, converged on Postville, Iowa. They arrested almost 400 workers from Agriprocessors, Inc., which, at that time, was the largest kosher meatpacking plant in the United States. Of the 389 arrested, three out of four (293) were Guatemalans. 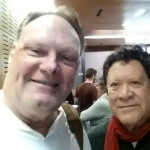 “What I thought would be a four-day fact-finding trip has turned into eight years,” Argueta told radio host Suzette Grillot on KGOU’s World Views program in 2016. The following are excerpts from the interview. I also just came back from Guatemala from working on an advertising campaign for an agency in Washington D.C. that is aimed at stopping the flight for safety and immunity. It is not going to stop until we change the structural conditions of the sending communities. But this campaign is aimed to make people at least think twice about sending their kids. And so, I have seen the phenomenon. It’s mind-boggling. However, we really must understand that until we address, in a robust fashion, what is pushing people away as well as pulling them, we’re going to continue to have this phenomenon. People know the risks of sending their kids but, when the families live lives that are full of dangers every day, when the risk of a child becoming a member of a gang, or maybe not reaching age 15 because he or she was killed, they’re … sending them north — at least they have some hope. And they also see the results of others that have succeeded in this trip. It’s a terrible situation on the issues that immigrants face daily, and that’s something that I wish on nobody. And they don’t do it lightly. You know people don’t leave their homes because they want to go to Disneyland. They leave because there’s no other choice. … one of the reasons I’ve been doing this for all these years is because I realize that often in the national conversation about immigration we get lost in the numbers. We talk about eleven million, quote-unquote, illegals, and then we forget the human face of immigrants — and that is what my work aims to do, to bring out that human face, to make us realize that in every immigrant we do have another human being that is just like us. You know, “there for the grace of God go I” means something that I have come to feel very strongly about. I had the privilege of going to meet Pope Francis two years ago and gave him a copy of my first two films, and I said to him, “These are the stories of the immigrants that have touched my heart and changed my life.” And, that’s what I hope to do with these films, and with this conversation, because I go to universities, faith-based communities, and conferences, and engage into one-to-one or small group conversations with the hope that we will be able to recognize ourselves in the immigrants. At the same time, I think it is essential that we understand the root causes of the situation. This is not something new. It is not something that only happens in the United States, it’s happening globally. So, we must all really roll our sleeves. Also, on the other hand, realize that there are laws in this country that cannot change from one day to the next. There are things that the president can do with the stroke of a pen, but also there’s a lot of other things that he alone cannot do and will need to change. You know, the support of Congress. So hopefully, our humanity will prevail, and our common sense will prevail. This country needs immigrants. We cannot say we’re not going to stop. We’re not going to prevent people from sending remittances to Mexico, Guatemala or El Salvador because those economies would collapse, and it will backfire. What impacted Argueta the most after the Postville raid was the response of the community, and then in other towns in northwestern Iowa. People gathered to support the immigrants who had been left behind after the raid and to support the relatives of those immigrants that were in jail. It was remarkable. Argueta goes on to say, “This impressed me so much that I said the story needs to be told, and it’s not going to happen in four days, so I stayed two weeks and went back many more times. Twenty-nine in total. I began to learn about the push factors that make people come to this country, and decided I’d better go to Guatemala to see the communities from where they came from. Something that struck me very much was how such a small Midwestern town could be such a microcosm of diversity,” Argueta said. He saw immigrants from all over the world, including Guatemala, Mexico, Somalia, Ukraine and Russia who all call Postville home. Argueta later traveled to his native Guatemala to visit the communities from where these migrants had fled. He wanted to learn why people chose to leave their homeland, which provided him with the ideal perspective of both ends of this epic journey. 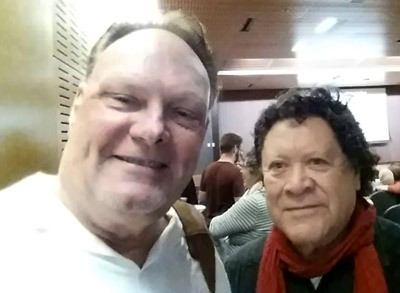 While on tour with “abUSed: The Postville Raid,” Luis met Lisa Kremer at a screening at the Community College in Worthington, MN, and a friendship ensued. A few months later, Lisa told Argueta she had just become a grandmother and had realized how many of the immigrant families in her parish had U.S. citizen children who had never met their grandparents. Out of that conversation Lisa founded “Abuelos y Nietos Juntos,” a family reunification program between the sons and daughters of Guatemalan immigrants in Worthington, Minnesota and their grandparents in San Marcos, Guatemala and Argueta offered help organizing -and documenting- the first family reunification trip. That is how “ABRAZOS,” the second film of Argueta’s series, was born. It is a story of 14 children (all U.S. citizens) who traveled for the first time from Minnesota to Guatemala to meet their grandparents, and in some instances, their siblings. Indeed, their story is representative of the almost five million U.S. born children who live in mixed-status families. Argueta reflected, “We really must think about those children who are part of the future of this country when we think about immigrants because they live in constant fear that their parents could be deported. And I don’t think that any child should live with that fear.” Argueta goes on to say, “… the film reflects the hopes, dreams, and fears of these transnational-families who, after being separated for nearly two decades, were able to embrace each other, share stories, strengthen traditions and begin to reconstruct their cultural identity.” Lisa Kremer and her husband, Pat, became executive producers of the film and dear friends of Argueta and his family. One of the most compelling scenes in the movie was when fourteen-year-old Lilla traveled 3,000 miles from Minnesota to meet her grandparents, Fidel and Lucía, in Ixchiguán, San Marcos. It is a desolate, isolated community. At 10,000 feet it is close to the Mexican border, and in times past the only crop was tiny potatoes. Currently, the economy is based on seasonal labor for men who cross the border to work on the coffee plantations in Mexico. 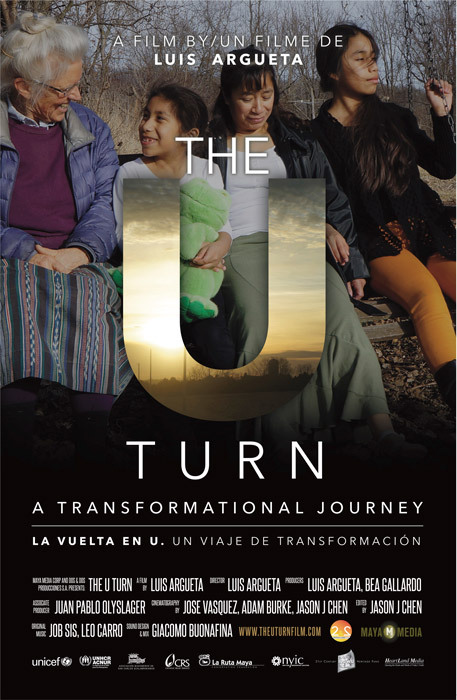 The third film in the series, “The U Turn” (2017), is about a group of immigrant women and children who broke the silence on the abuses committed against them at the Agriprocessors, Inc. plant in Postville, Iowa. Thanks to the solidarity of the community that accompanied them, and to the U Visa, their lives were transformed along with those who walked along with them. Argueta has become an expert on the complex issues of immigration in the U.S. He has screened his films at multiple college campuses and led discussions after the viewings. He has participated in various panels on the subject and respected due to his expertise. Argueta recently presented screenings of “The U Turn” at the University of Arizona in Tucson, as well as Arizona State University in Tempe. During his week-long visit to Arizona, he visited several social centers and met the families waiting to claim asylum. He also presented “ABRAZOS” at two shelters for unaccompanied minors. Less than a week after his visit to Arizona, Argueta was interviewing some of the members of the Honduran Caravan as they passed through Guatemala (Oct. 2018) to learn why they were escaping their homeland. There is no doubt that there will be much more to come from Luis Argueta! As a student at the University of Michigan Luis Argueta enjoyed his first American Thanksgiving with Ken Lehman’s parents in Highland Park. Later Lehman and his wife, Lucy, would introduce Argueta to a very talented lady who was the chief of staff of several high-level government officials in Washington D.C. Much to their surprise, they hit it off, and Argueta went on to marry Jennifer. To this day, the couple refers to the Lehman’s as their Padrinos de Boda. After Lehman left the Peace Corps, he became the co-chairman of his family-owned business, Fel-Pro Incorporated, an automotive component-parts manufacturer. 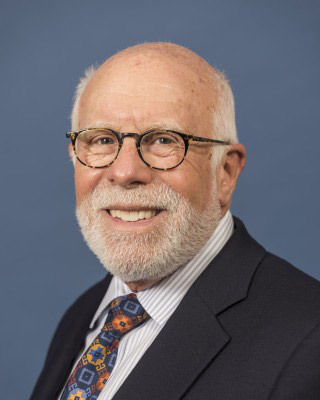 He also served as a Peace Corps staff member in the Latin American Bureau of the Peace Corps and would go on to become the vice-chair of CARE International’s board and a board member of Public Radio International. Lehman would continue to be a close friend and significant advocate of Argueta. In January of 2017, he nominated Argueta for the Harris Wofford Global Citizen Award (Harris Wofford, a U.S. Senator, was instrumental in the formation of the Peace Corps). The award is given annually to an outstanding global leader who grew up and lives in a country where Peace Corps Volunteers served and whose life was influenced by the Peace Corps. The raid was at Agriprocessors, Inc., a kosher slaughterhouse and meatpacking plant in Postville, Iowa, in May of 2008, executed by the U.S. Immigration and Customs Enforcement (ICE) division of the Department of Homeland Security. Together with other agencies, it was the most massive single raid of a workplace in U.S. history at that time. The Supreme Court later ruled that undocumented workers could not be charged with aggravated identity theft. That is unless it was established that they knew that they had used an authentic Social Security number, prompting calls by some immigration attorneys and members of Congress to dismiss previous convictions against immigrants for aggravated identity theft and consider rejecting the guilty pleas sought against the Postville workers. Several employees and lower- and middle-level managers were convicted on charges of conspiracy to harbor illegal immigrants, aggravated identity theft, and child labor law violations, among other offenses, serving prison sentences between 60 days and 41 months. Neither the owner, Aaron Rubashkin, nor his sons Sholom and Heshy, in charge of the management of Agriprocessors, were convicted of immigration or labor law violations, although both Aaron and son Sholom were initially charged with 9,311 counts of child labor law violation, for which they could have faced over 700 years in prison if found guilty. All charges against Aaron were dropped right before the trial was scheduled to begin, and after a five-week trial, Sholom was acquitted on all charges of violating child labor laws. His case was later completely expunged from Iowa state records. But financial irregularities brought to light by the raid, and subsequent investigations led to a conviction of the plant’s chief executive, Sholom, on bank fraud and related charges. He was sentenced to 27 years in prison. After an outcry by a bipartisan group of more than 100 former high-ranking and distinguished Department of Justice (DOJ) officials, prosecutors, judges, and legal scholars as well as with the severity of his sentence, on December 20, 2017, President Trump commuted his sentence to time served. His trial on immigration charges was canceled. REVUE magazine article by Mark D. Walker. Mark’s passion for Guatemala started as a Peace Corps volunteer, followed by a career working for eight international organizations including MAP International, Make-A-Wish International and as the CEO of Hagar, which works with survivors of human trafficking. According to Midwest Review his book, “Different Latitudes: My Life in the Peace Corps and Beyond,” … It is a story of one man’s physical and spiritual journey of self-discovery through Latin American, African, European and Asian topography, cuisine, politics, and history. His most recent article, My Life in the Land of the Eternal Spring, takes place on a coffee plantation in Guatemala and was published by Wising Up Press as part of the Crossing Class: The Invisible Wall anthology. Mark is a board member of Partnering for Peace and Advance Guatemala. He received the Service-Above Self award from Rotary International. Both his wife and three children were born in Guatemala. I just sent in a support letter for the nomination of Luis for the prestigious Harris Wofford Global Citizen Award. Fellow Returned Peace Corps Volunteer/Guatemala, Ken Lehman nominated Luis. We need more global leaders telling the story of immigrants coming from Guatemala. I’m working on a second article to share the broader story about the immigration crisis. Luis will be awarded the Harris Wofford Global Citizen Award on June 22nd at the Peace Corps Connect Conference which is hosted by the University of Texas in Austin. I’ll be there to celebrate this auspicious occasion. Will do. With a commentary on the proceedings!